Celebrating 13 Years of Making Music Makers! | Music Makers For Life, Inc.
Music Makers For Life, Inc. Celebrating 13 Years of Making Music Makers! Our new address is 256 Oak Street. Our unit faces Terra Cotta/Rt. 176. We are right across the street from St. Thomas the Apostle Church, and right next door to Gulgren Appliance. Our music school offers music classes year round in Piano, Guitar, Drums, Voice, Woodwind and Brass Instruments, as well as Violin, Viola, Cello, and Harp for children and adults. Group lessons and private lessons are available. At Music Makers for Life the focus is on learning to read and play or sing music for the individual child. The goal is not to create the next Mozart or Beethoven (We don’t expect every child who learns to read and write to become the next Hemingway). We want your little musician to be confident and enjoy the musical experience. Kids love their piano lessons, guitar lessons and voice lessons because we make it fun. As a result, our proven methods have successfully created musicians that not only read and play their music well, but have gone on to professional careers in music. We have hundreds of students that have and still read music, play their chosen instrument, and are now a Music Maker….FOR LIFE! 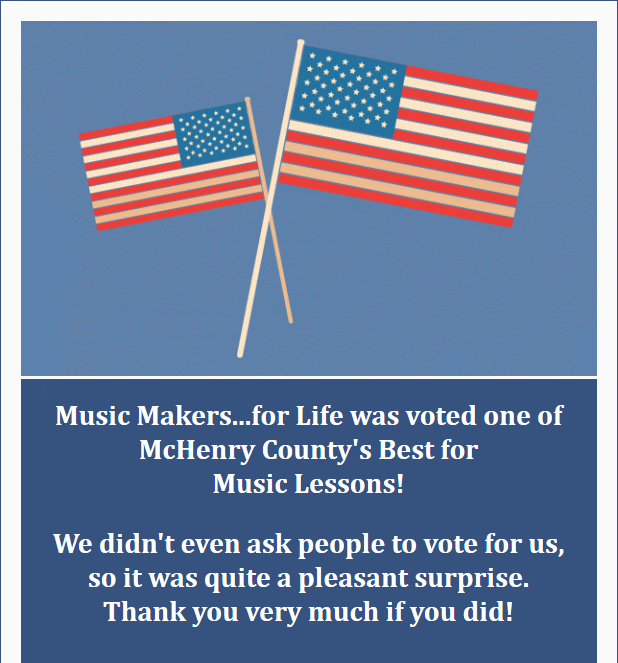 We are always enrolling, and work with you to find a class and time slot that works for you, so call (815-444-9444) or email (Musicmakers4life@gmail.com) to set up lessons! © Copyright 2013 Music Makers...For Life, Inc. All rights reserved.